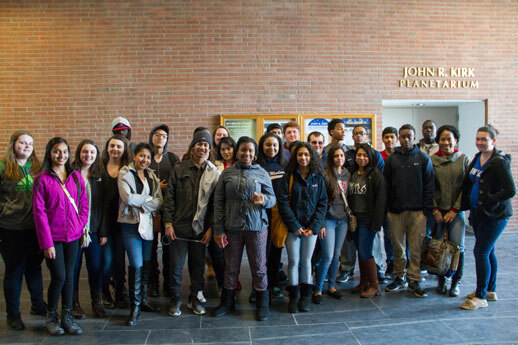 A partnership between SUNY New Paltz and the Newburgh School District through Let’s Get Ready, a non-profit organization that supports underprivileged high school students, is making free SAT and college preparation programming available to local high school students. Let’s Get Ready works by providing training for college students in SAT course instruction and helping them connect with high school students in traditionally low-income districts, in an effort to increase college readiness and enrollment. This semester, 12 New Paltz students received training and have coached dozens of Newburgh Free Academy (NFA) students at the Newburgh Armory Unity Center (NAUC). New Paltz student Mariah Brown ’15 (Journalism/Black Studies) is a Let’s Get Ready alumna who was motivated to return to the program as a site director because of the impact it had on her when she was in high school. The organization reports average SAT score increases of 115 points for its participants, more than 92 percent of whom enroll in college after high school. Students of the program get more than just guidance in passing the test, however, as their mentors offer advice about the college application and admission process, financial aid and college life. Let’s Get Ready was founded in 1998, and has grown to enroll more than 25,000 students and has trained more than 8,000 college students as coaches to mentor them. The organization is funded by private and corporate donations and sponsorships, which allows it to provide for program administration, instructor training, transportation, classroom materials and food for more than 30 college-high school partnerships in the northeastern U.S.
Additional support of the New Paltz-NFA partnership is provided by the Athletic Department, which made vehicles available to transport College volunteers to and from Newburgh. More information about Let’s Get Ready and the Newburgh Armory Unity Center is available online.